Our Coaching Staff would like to welcome you to the Temecula Swim Club! Below are biographies of our staff, as well as some of their accomplishments. All TMEC coaches are background checked through USA Swimming’s Coaches Background Check system, and all have current certifications in American Red Cross First Aid, CPR, and Coaches Safety Training. 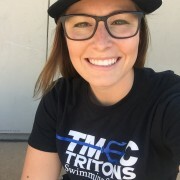 Coach Jenn Beech has been with the Temecula Swim Club for over eight years and brings over thirteen years experience to our program. 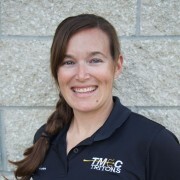 Coach Jenn is our Head Coach of TMEC and she runs Age Group #1. Coach Jenn's athletes have earned Junior Olympic, Age Group Invitational and SCSRT times. Coach Jenn is a pivotal part of our clubs group progression program. She has also attended the USA Swimming National Diversity Camp as an assistant coach in 2017. 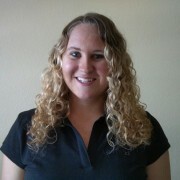 Coach Jenn began competitive swimming at age 4 for a summer swim club called the Newport Shores Sharks. From age 10-15 she was a part of the Newport Beach junior lifeguard program; where she was introduced to Open Water Competitions. 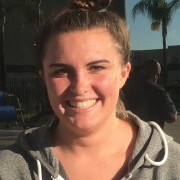 She competed for Newport Harbor High School four years in swimming and water polo; in her senior year she was awarded the Coaches Choice Award in water polo and Most Improved in swimming. She has 8 years experience as a pool and beach lifeguard. Coach Jenn is a USA swimming Coach and she is certified in American Red Cross lifeguard, First aid, CPR, AED, Oxygen administration and WSI. In the past has worked for City Aquactics Programs and also worked as Pre-school Teachers Aid for two years. Hi! I'm Taylor. I have been an athlete all of my life. I played soccer for 12 years until I had a knee injury. I ended up switching to water polo my sophomore year of high school. I was a three year varsity water polo starter for Vista Murrieta High School. At Vista, I was named 2nd Team All-League twice, 1st Team All-Riverside County, and 1st Team All-Californian. I received a scholarship to Azusa Pacific University where I was a four year starter for them. I was the leading scorer all four years and currently hold four school records: Most Career goals, most multi-goal games in a season, most assists in a game, and most goals scored in a tournament. I graduated in 2015 with my degree in Graphic Design and I have 5 years of teaching swim lessons experience. Hailey is very involved with swimming program at Vista Murrieta High School, along with also being in the choir and drama programs. Nicole started her swimming career at age 12 with TMEC. Nicole started swimming with TMEC when she was 12 years old. She continued to swim with the club while swimming for Great Oak High School for her four years. Her Junior and Senior year Nicole went to CIF for the 100 breaststroke and made finals as well as consolation finals for the 200 IM. While on the high school team she also was in the senior group and was team captain. In 2013, she began her collegiate swimming career at Concordia University in Irvine, making National cuts and swimming in Oklahoma as a freshman. She transferred out to complete her AA in science at a more suitable school. Nicole coached the Shark Attack summer swim program teaching 4-12 years olds how to swim. She became a competitive age group coach in the year 2016 until she had her son in 2017. Outside of work she loves to spend her time with her husband and son, while going back to school to complete an MA certificate program.